Hondurans waving torches may have taken to the streets demanding his resignation over corruption, but their president said Wednesday the U.S. Congress may pass a huge Central American aid package anyway. “I do not see any big complication,” President Juan Orlando Hernandez said in an interview with news agency reporters. The billion-dollar development package called the Alliance for Prosperity is designed to try to curb poverty and violence that send tens of thousands of Central Americans fleeing north each year through Mexico in search of work and a better life in the United States. U.S. senators and representatives have traveled to Honduras and have a “clear vision” of how the government is dealing with the corruption allegations, Hernandez said. In recent weeks, tens of thousands of Hondurans have taken to the streets, chanting and waving torches against the night sky as they demand the president’s resignation. They allege he received government money illegally in his campaign for the 2013 presidential election that he won. Early this month Hernandez admitted his conservative ruling National Party had in fact accepted money that had been misappropriated from social security funds. The opposition charges that the president received about $90 million of more than $300 million they say was skimmed from dirt-poor Honduras’s public health system for his election campaign. Hernandez has denied wrongdoing and drastically played down the amount his party received. In the interview Wednesday, Hernandez insisted he had made clear that his administration was acting firmly to determine who embezzled the money. It has also taken over some government agencies and seized property from suspects in the scandal, he said. The streets may be teeming with anger now, but people will eventually support the government’s efforts to combat corruption, the president said. He alluded to a proposal Tuesday from leaders of civil society organizations to devise an action plan, with help from international prosecutors, to fight government corruption. In the street rallies, there are people with legitimate gripes, but joining them are opposition leaders seeking to undermine the president, plus people linked to drug trafficking, Hernandez said. “These marches have been used by groups that had committed acts of corruption, but those who are legitimately outraged are beginning to discern the difference,” the president said. Hernandez had come to Washington to meet with the new secretary general of the Organization of American States, Luis Almagro, and with U.S. Vice President Joe Biden to discuss the development plan. President Barack Obama has asked Congress for one billion dollars for the initiative, but Republicans in Congress have expressed reservations. 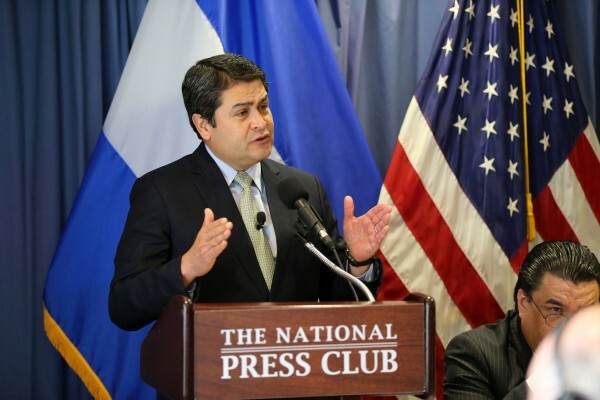 To overcome those misgivings, Honduras will disclose details of the plan to leaders of the two chambers, Hernandez said. A Central American region that is prosperous and peaceful, “is a tremendous investment for the American people” the president said. “I would hope that the leaders in Washington would understand that,” he added. Still, the American aid is only symbolic. Passing the package, he said, would mean Washington acknowledges that a huge part of the problem is Americans’ appetite for drugs like cocaine that are produced in South America and smuggled through destitute nations like Honduras, El Salvador and Guatemala to reach the streets of the United States. “In the end, it is not so much the money. It is the message that the United States takes responsibility for generating violence and migration as a result of drug trafficking in the region,” he said.